Landscaping goes beyond grass, flowers, bushes and a fence. Thanks to construction technology, there are a wide variety of options to create the right look and function. For homeowners who want to take the appeal of their yard to a whole new level, many consider boulder retaining walls. They are a classic landscaping feature that offers vast benefits for outdoor spaces in terms of drainage and erosion prevention. If you are trying to achieve curb appeal, retaining walls that allow plants and trees to grow behind it allow for a sloping yard to become a flat surface. The construction of these walls depends on how steep the slope is as well as the height of the ground. And you can choose the design of the boulders used according to your preference as there are many styles and varieties available. If a home or facility is built on a slope, a major concern is that the soil shifts when it rains. A boulder retaining wall is a durable option due to the wall providing a functional support for retaining the soil even in rainy conditions. If loose soil on a slope characterizes a piece of land, then layered walls are a suitable option for both its functional and decorative purposes. Rychart Excavation Inc is a well-established company with experts working at the peak of their profession who offer a variety of concrete retaining walls built for large or small scale projects. 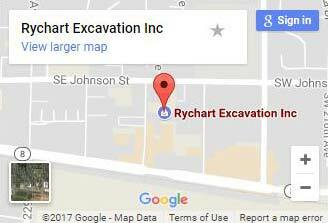 Rychart Excavation, Inc. is a full-service contractor, offering consulting, planning, land clearning, supply and delivery. Our team has the equipment, knowledge, and machinery to create boulder designs to suit our client’s tastes and preferences as each can be selected to match the architecture of the home or facility. Talk to us about what we can do to make your landscape project easier.